Want to take a shot at predicting how the stock market will do this year? Well you can always try to turn to the beginning of the year to see how January turned out. If you believe the saying coined by the 1972 market historian Yale Hirsch: “as January goes, so goes the year,” then you might get some clues about how the rest of the year will end up. This belief has some relevance if you note that the January barometer, which is the indicator that suggests that the stock market performance in the month of January dictates the overall year’s returns, has actually been accurate 80% to 91% of the time since 1950. Why does it work so well? Because in general, trends go a long way in decently predicting market direction within the short term. Still, according to the Stock Trader’s Almanac (an organization that’s been tracking historical market information), it’s not been a perfect predictor since it tends to be less correct during years when the market slumps in January, such as in 2003 and 2005. I invite you to take a look at this chart that shows the close of January 2007 to the end of January in 2008 to assess the merits of the “January Barometer” in recent years. This effect is a seasonal one which affects stocks, and small-cap stocks in particular. The effect here is to see stocks increase in price sharply from the end of December (the 31st) all the way through the first week of January (usually the 5th trading day of the new year). So what causes this? It is attributed to end of year selling and trading to unload losing stocks, to capture capital gains, generate tax losses and to raise cash for the holidays or to cover the subsequent consumer and personal debt that may come after the holiday season. It is also attributed to buying strong stocks for “window dressing” purposes. 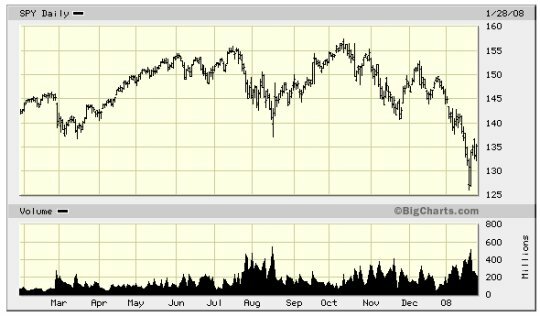 You may wonder how the wave of selling here can trigger the January effect — well it does, if you consider that bargain hunters are waiting in the wings to pounce upon stocks that have eroded in price due to seasonal events. These same bargain hunters are expecting a bounce back for the prices of stocks later on in the year (or for the longer term). Another interesting note is that the January effect has become more minimized in recent times due to the fact that more investors are aware of this phenomenon. Instead, there also has been some seasonal adjustments that have been taking place, causing this effect to shift to December. If you see stock prices rally in December, then this may very well be just the January effect happening earlier than usual. This, by the way, is called a Santa Claus rally or the December Effect. It is also typically noted by the financial community and reported by the media as one of those occurrences that sets the tone for the rest of the year. Have a good January and the rest of the year is expected to follow suit. 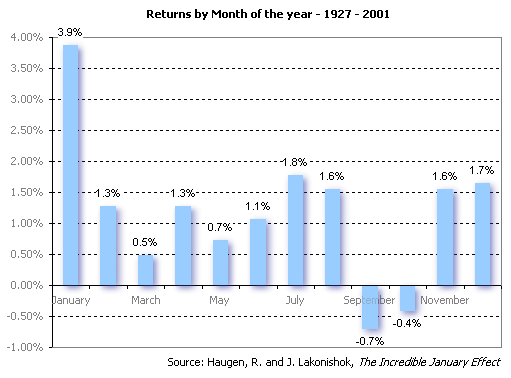 Likewise, hang on tight for a wild year when the month’s returns are lousy. Throughout the years that I’ve dabbled in the stock market — starting sometime in the 1990’s — I remember seeing the jubilance and hyperactivity of investors and speculators alike, take over during the start of the year while the newbie investor that I was simply looked askance, wondering how I could possibly be so fortunate as to make money so easily that way. I was quite glad for the January Effect because it was one of those things that gave me some encouragement about staying invested and keeping on an investment program. Somehow I saw my fledgling mutual fund accounts gain ground during those early months of each year of the historical 1990’s bull market and needless to say, it got me hooked. How can you not? Heady days like that are what you’re in the markets for. Though the market is unpredictable and volatile, I somehow placed my bets on riding the phenomenon to help tide me through the rest of the year. Most of the time, it seemed to work. Obviously, this phenomenon as they call it, is not etched in stone. Realize of course, that the #1 rule in investing is that nothing about the markets is etched in stone. Thus, my question — are you going to take a chance on it this year? Well, one never knows how the equity markets are apt to perform come next month and there have already been some rumblings about its impending behavior, but with the ever so slight correction having occurred this December, I wouldn’t be completely out of line to surmise that there could be a bounce back in the near term (in fact, it’s already happening with the recent record highs — or could this be the aforementioned Santa Claus rally?). So if you’re looking for a time to lighten up on stocks, say while you’re rebalancing your portfolio, you may want to consider these few months as the opportune time to sell on strength. I won’t bet too much on the January effect. When everybody knows it and try to make money out of it, the method will kill itself. So did those open investment secrets such as “Dogs of the Dow” theory. That’s quite a spectacular graph! On the other hand, it is entirely for the “Buy & Pray” folk – and to me, that’s just gambling. Give me volatility trading any day of the week – you know there’s a big move coming, and you position yourself to profit whether it’s up or down. Trying to second-guess the market is pure folly that has driven more than one poor investor to the wall!